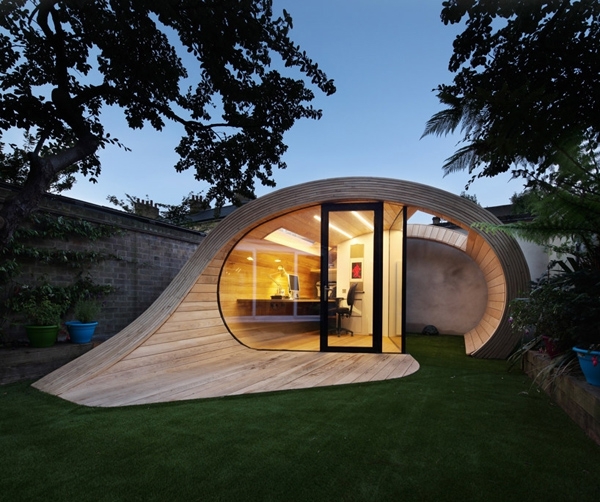 This garden office for work at home individuals is unconventional in almost every sense of the word. 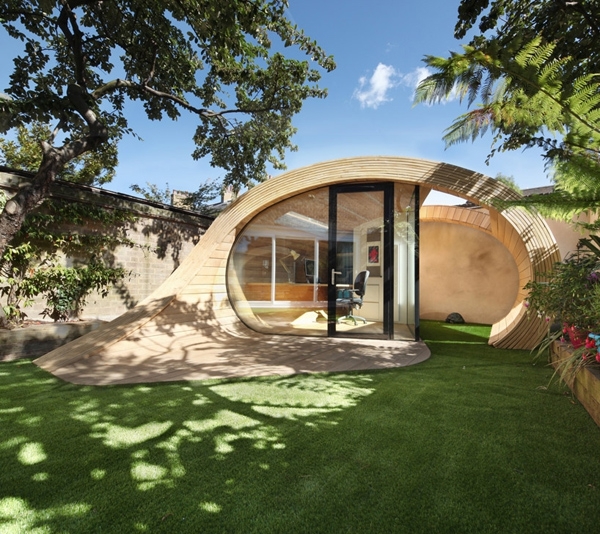 It is called the Shoffice and is designed by Platform 5 Architects. The roof is designed with a skylight to let in copious amounts of natural light. The timber wood used to frame the structure is of a light brown texture accentuating the natural light facilitated by the roof. 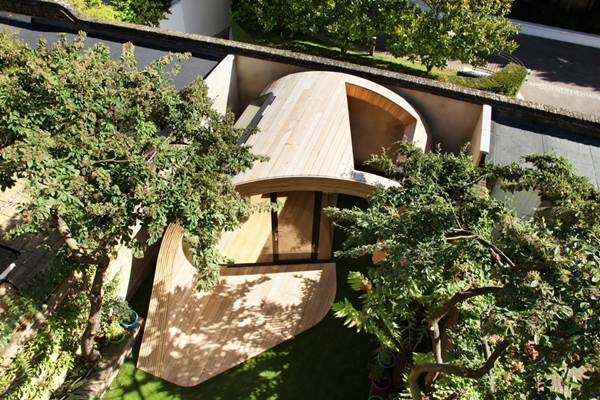 The wood patio merges into the unconventional rounded shape of the building itself allowing for a sense of continuity. 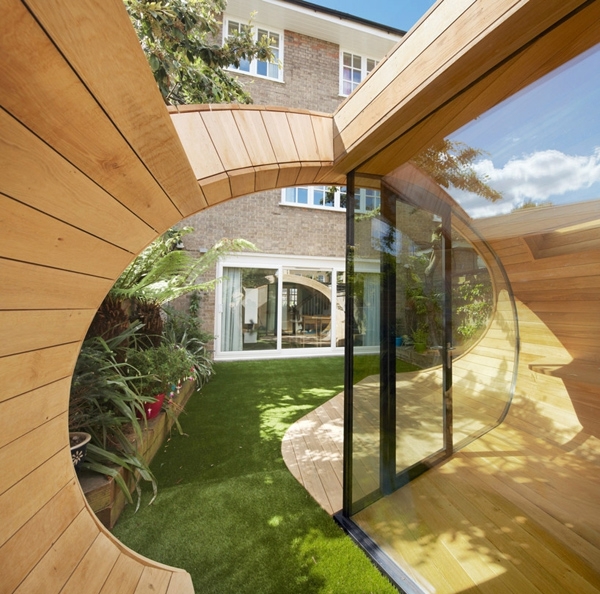 The entrance to the garden office is itself a combination of the patio and the lawn, which extends into the remainder of the outdoor space. The glass doors allow visual and physical access to the outside environment which includes an organized combination of different plant life. 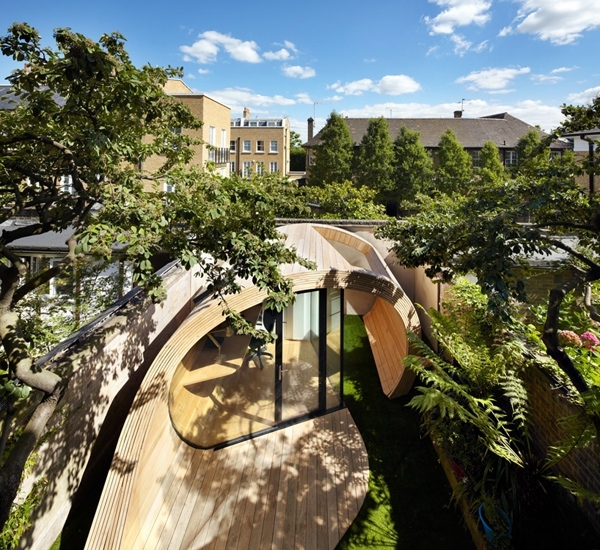 Larger trees tower over the space in front of the entrance but at the same time without affecting the lighting of the garden office. Smaller potted flowering plants, mounted on the two lengths of short walls flanking the lawn, help to beautify the scene and create a serene setting. In addition to allowance for natural lighting there are artificial lighting features which should come in handy for those who often, or occasionally, burn the midnight oil. Light fixtures are installed along the wall above the work station and on the ceiling. This is accompanied by a lamp. Inside the office a cozy yet professional atmosphere awaits. The work surface protrudes from the wall and is complemented by office furniture such as a chair and a computer. Shelves are also installed on the wall space for needed storage. A short walk from the main building takes you to this garden office and the fact that it is not directly attached to the main building is one of its unique features. It is as inspirational as it is functional. It is the ideal place to work in comfort when traditional employment methods just do not match up with your dreams.